Press CTRL + D to add the file called frmBMI.vb from the above folder into your project (or right click on the project and choose to add it as an existing item). The idea is that when you click on the button, you'll see your BMI. Hope it's better than this trainer's! 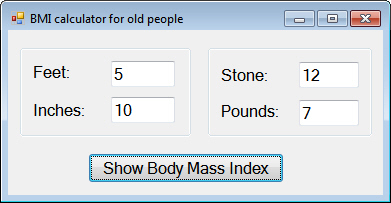 Write the BMI function to make this work, using the constants supplied at the top of the form's class. A person's BMI is their weight in kilograms divided by their height in metres squared, and there are 12 inches in a foot and 14 pounds in a stone!